What is Europe's stance on diabetes? The International Diabetes Federation, also known as the IDF is an organisation focussed on engaging in action to tackle diabetes from local to global level. You might remember that I attended a youth leadership in diabetes camp with them in Italy last year. The way that the participants that met at the camp last year has stayed in touch despite being spread across Europe has been great. So when the organisation got in touch to ask if I'd like to fly to Brussels to be the official blogger for the European Summit on Chronic Diseases, of course I said yes. With thanks to IDF Europe and the event sponsors MSD - who are a global healthcare leader working to address global unmet health needs. I will be flying to Brussels to report from the conference and using social media as the platform to do share the event with others. I’ll be blogging about all of the great things going on at the summit each day and reporting back to you on the blog and on Twitter. The conference is taking place over two days – Thursday April 3rd and Friday April 4th. Day one’s exciting agenda involves workshops at the Albert Borschette building leading onto a reception at the Berlaymont building in the evening. Day two will hold the official plenary sessions at the Charlemagne building in the heart of the city. 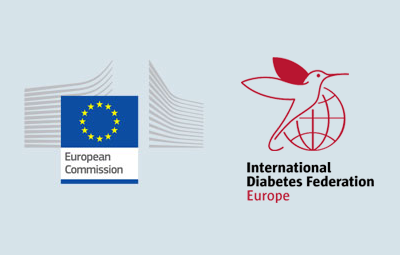 There are so many reasons why this event is exciting but one of the main ones is that it will be the first EU summit on chronic illness and not only that but diabetes is going to be a big focus for discussion. The event is a call to action, aiming to bring together key policy makers, stakeholders and interest groups to find ways to address chronic diseases effectively in the EU. Also to develop recommendations in answer to key questions such as- how does the expanding ‘burden’ of chronic diseases affect the quality of life of citizens and what can the EU do about it. How can that ‘burden’ be reduced and which prevention measures are the most effective in the short and long term to name but a few key questions. The workshops available for participants to attend are focussed on topics such as ‘Addressing major chronic diseases in Europe’, ‘Effective frameworks for the prevention and management of major chronic diseases’ and ‘Acting more efficiently on risk factors and determinants’It’s sure to be an exciting event and one from which the effects will be far reaching. For those people who are on Twitter and want to keep up with the event, there will be a general event hashtag which is #EU4Health. But the diabetes related one is #diabetesatEUsummit . If you’re not on Twitter but still want to keep up to date there is a Twitter feed on this blog so don't worry, you don't have to miss out! I will also be writing blogs throughout the event for a more detailed account of the summit. So watch this space!